I am quite defensive about my alma mater's campus. Washington University in St. Louis has a beautiful set of pre-war buildings and a lovely setting for them. It's one of the finest college campuses I've seen, and I rank it equal to or greater than such notables as Yale and Princeton. But I am a realist. I know when I'm beat. 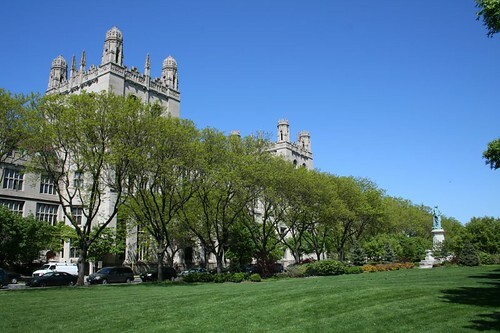 And it's abundantly clear that the original portions of University of Chicago's campus simply blows Wash. U, and nearly any other campus you care to name, out of the water. And that is not a slight against Wash. U in the least. 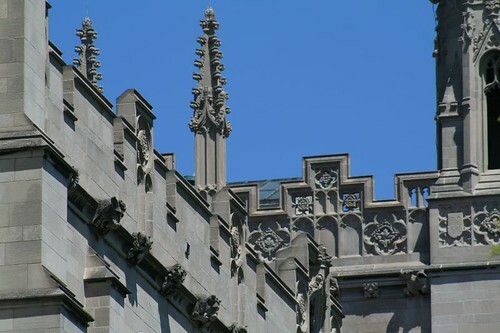 The original Gothic Revival academic buildings are huge, rising four to five stories high, with towers extending beyond that. 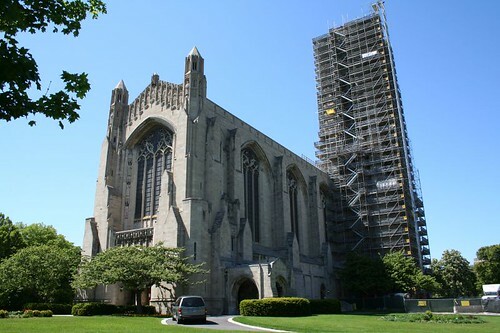 They draw from a variety of inspirations, from chapels, cathedrals, chateaus and castles. Having mainly sprung from the pencil of architect Henry Ives Cobb, and later Shepley, Rutan & Coolidge, they are remarkably unified. 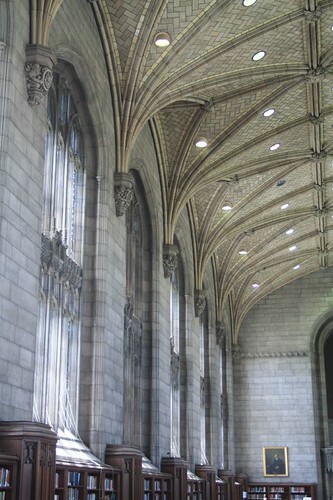 Cavernous spaces await within, some as elaborately ornamented as the buildings' exteriors. 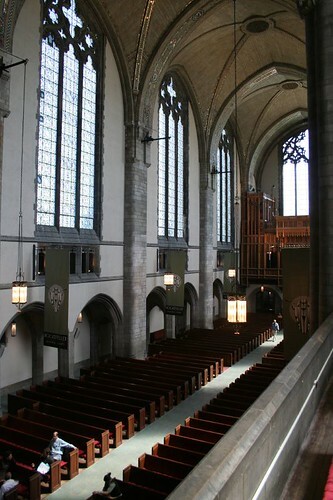 The completion of these quadrangles is a major coup for the University's design (Wash U, by comparison, never finished any of its planned quads beyond the first one at the front of campus.) Each is filled with greenery, including towering old growth trees that complete the image of a genteel outdoor room. 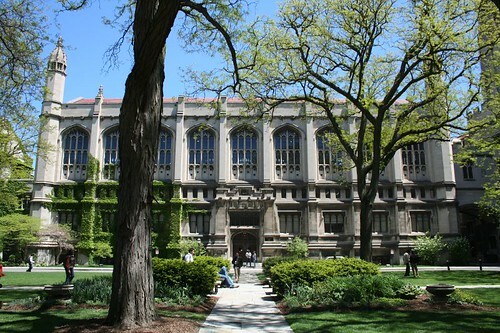 Each is lined with heavily ornate buildings, the ideal picture of academic life. But I'm here to praise, not critique. Within that one superblock, the University's architects laid out a magnificent tribute to the power of unified design. 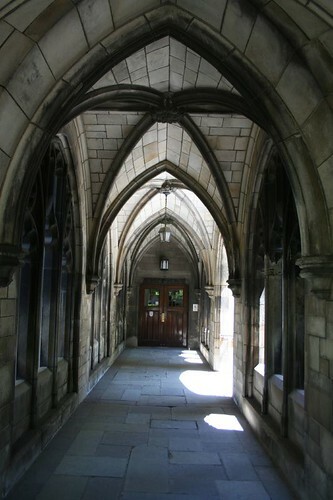 Surrounding buildings continue the theme of magnificent Gothic, but none have the unified quadrangle configuration of the original campus core. 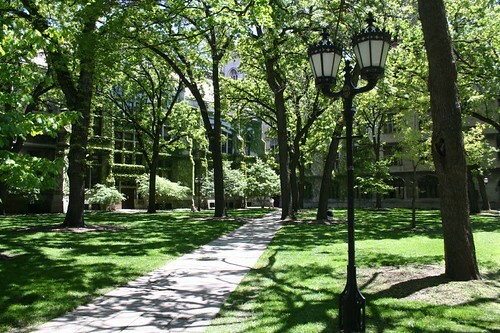 The U. of C. campus was one of my formative images of Chicago, one of the first places in the city outside the Loop that truly blew my mind. Yet somehow I've never given the whole thing a thorough photographic documentation; my recent three hour visit barely scratched the surface. I'll be back, for certain. I hope those who live, work and study amid the grandeur and beauty of the campus core appreciate it as much as it deserves. Great pictures! I definitely appreciated (and continue to appreciate) the architecture of the campus, though many do not give it much thought. It's one of the things that started getting me into architecture after coming to Chicago, for sure. I hope it wasn't too insufferable of me to go through and fill in details about the buildings on your Flickr postings. The campus really does disintegrate once you get away from the main quads, which is too bad. But it's just a symptom of the direction that architecture has taken, with an emphasis on individual and iconic buildings rather than organic wholes. 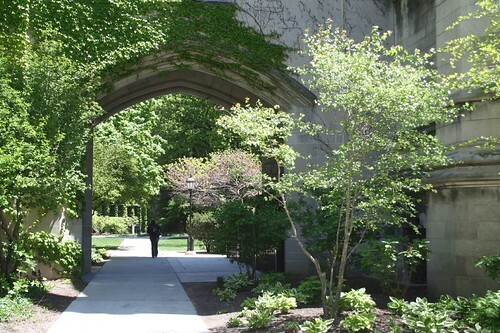 There are some great things to see in the northern part of the main quad: Hull Gate (and its famous gargoyles), Botany Pond, the Reynolds Club (basically the student union) and its impressive Hutchinson Commons. Thanks! I've visited most of those places, but somehow I've never photographed them. I hope to remedy that soonish.